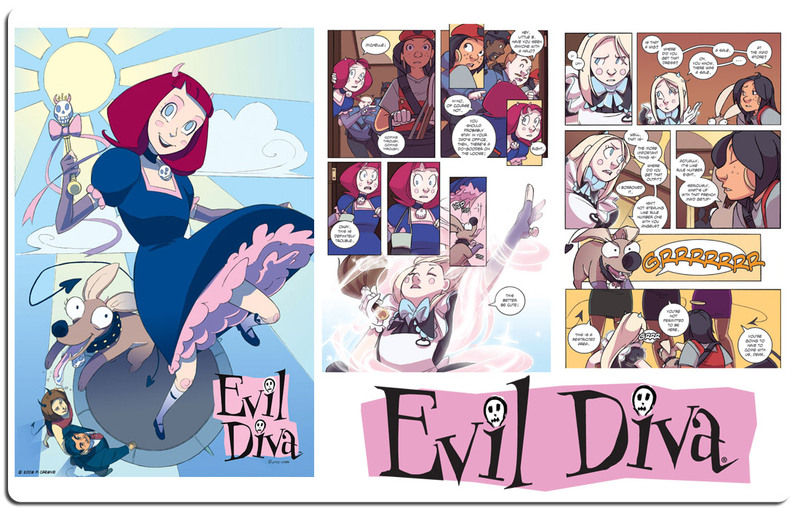 Evil Diva is the hit online comic created by Peter Menotti and written by Joe Cashman. It was done as an in-house experiment and has turned into one of the most popular comics on the web. It was recently published by Angry Viking Press with distribution by Diamond. Look for it in your local comic book store. Modul8tion has plans to expand the license in order to reach a wider audience. Evil Diva is another reason why we love our jobs. Through the comic, we have really been able to let our creative juices flow. It began as a tale of a little devil girl who just wanted to do good deeds as she entered middle school and grew into the only G rated comic in TopWebComics top ten. It’s one of the few comics out there with a strong female character. Over the years Diva has grown up and the content of the comic matured as well. We are proud to have created complex characters and intelligent story lines that appeal to adults and children alike. Through it all we have been able to maintain our considerable fan base, while still producing something our kids like to read. Need comics produced for your product or event? Need characters designed? Let us provide you with some of the best sequential artists and inkers in the business. We are adept at turning the mundane into the extraordinary. Call us to find out how we can help breathe life and personality into your idea. We will give you something to cheer about and you may even pick up a few fans on the way.